Dear NOOK drop2sync customers, due to a change in Dropbox’s API (interface for applications) and declining sales after the free Dropbox and Box apps became available, we have decided to discontinue Drop2sync for NOOK. Ongoing research is shedding new light on the importance of math to children’s success. Math skill at kindergarten entry is an even stronger predictor of later school achievement than reading skills or the ability to pay attention, according to a 2007 study in the journal Developmental Psychology. Fourth-grade son: 2-12 times 2-12 (soon to add division once his speed is solid) – again 0 and 1 are easy so we don’t do those. One son likes the timer, one doesn’t like the pressure. Fortunately, it’s configurable! 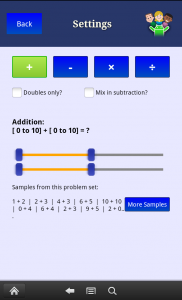 You can get CardDroid Math today. My kids check off their 15 minutes a few days a week before they get free time. If you get it now, you also get the fall 2012 upgrade for free when its released. Best wishes for wiping out any math-phobia in your home! What are your tips for building confidence in kids? Let us know in the comments section below! My kids will be out of school at the end of the week so our family is making up a list of fun things to do. My wife and I are also making a daily checklist for the kids with some chores that can help our family and some tasks to help keep them sharp over the summer. Both boys have “time with CardDroid Math Flashcards” on their lists a couple of times a week. They also have journaling assignments and our son who has handwriting challenges will copy a paragraph once a week. The whole thing should amount to less than 30 minutes a day and they’ll be way ahead in the fall. Anyone else have plans to help their kids avoid the “summer skill loss”? What are your ideas? 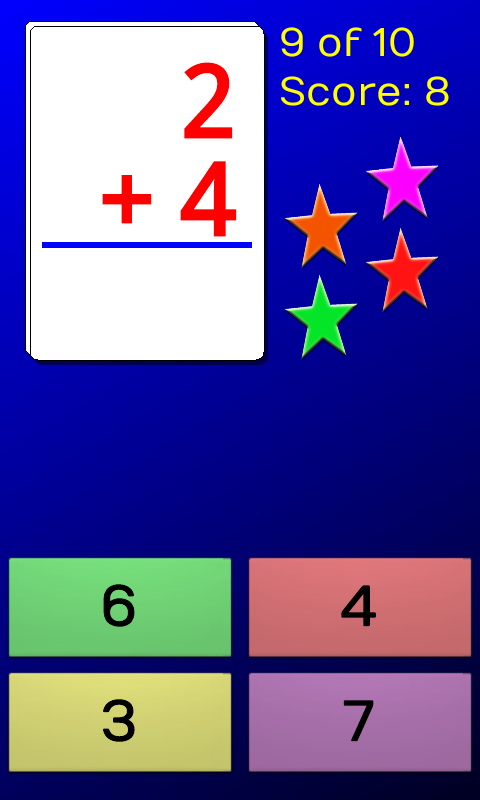 CardDroid Math is now available for the BlackBerry Playbook. They didn’t want any “droids” in the name so on that platform it’s called “Math Fact Flash Cards.” Check it out at BlackBerry App World at http://appworld.blackberry.com/webstore/content/89826. Same great app, different name. Have fun! 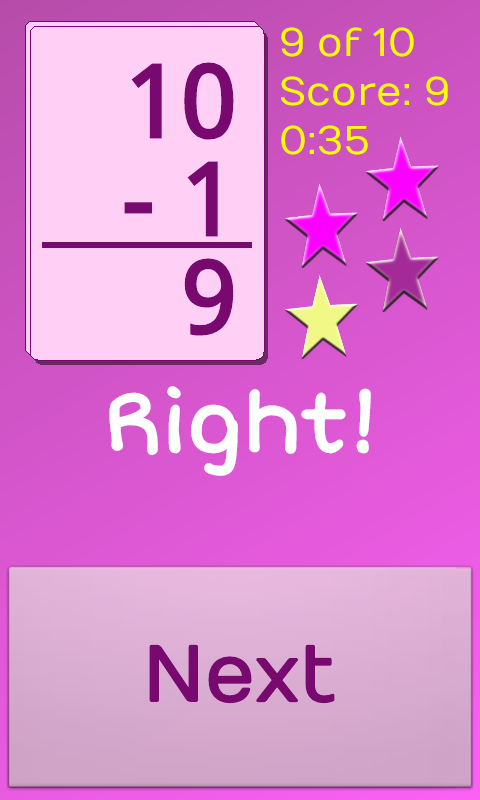 Grab CardDroid Math Flash Cards for 99 cents on Android Maket, Amazon Appstore, or the Barnes & Noble Shop and let the learning begin! 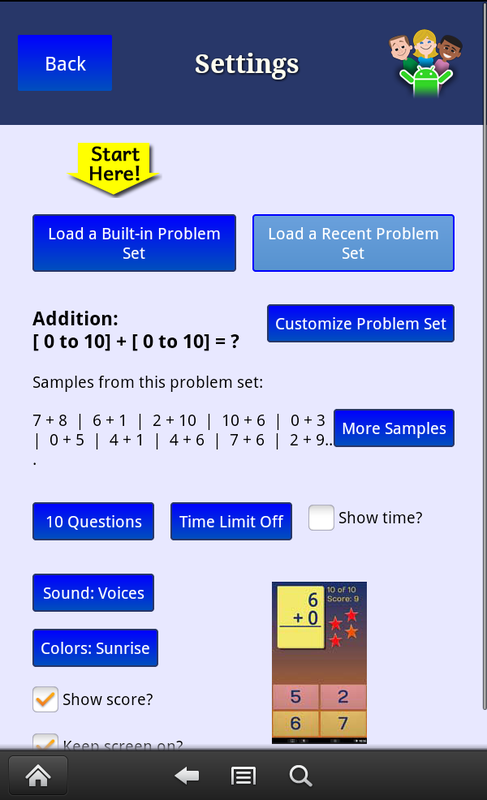 A helpful customer has reported a problem in version 2.2 of CardDroid Math. If you go to the “Built-in Problem Sets” screen of the “Recent Problem Sets” screen and tap the system back button (hardware button or bottom edge of the screen), CardDroid Math will unceremoniously crash. The workaround is to tap the big blue “Back” button toward the top of the screen. Version 2.3 is now available and looking rock solid! WhitneyApps updates our apps regularly, people – especially Kindle Fire and NOOK tablet users – miss out on these free enhancements and fixes by continuing to use the old version. It’s time to change all that! Here’s how to get those updates. Be sure to connect your device to Wi-Fi before you do this. Now let’s go! We’ve been approved as a commercial seller in Samsung Apps so all you Galaxy S and Galaxy Tab owners will see our apps soon complete with Samsung’s seal of approval. We’re deciding whether to bring drop2sync to the GalaxyTab so if you’d like to see that, please let us know! More news when the apps are approved and on sale! 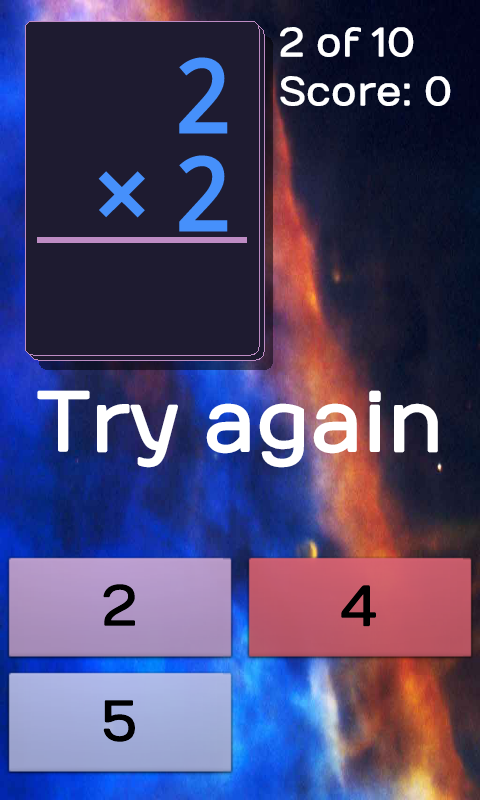 Jenny, an observant customer on the Amazon Appstore, spotted a bug in CardDroid Math 2.0 that affected selection of subtraction problem set number ranges. It’s fixed in version 2.1, which is live now on Android Market and should be available in the Amazon Appstore and the Barnes & Noble NOOK shop by January 20th if their approval process goes as expected. Remember, if you have trouble with one of our apps, send us email so we can help you out or fix the problem. And thanks again to Jenny! 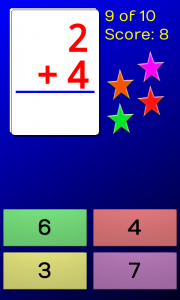 CardDroid Math version 2.0 available now in the Android Market, the Amazon Appstore, and the Barnes & Noble Nook Shop for 99 cents. 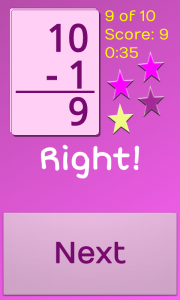 Great for helping kids learn math facts – with levels for kids in Kindergarten to 4th grades (also preschool with adult help or older kids who would benefit from review or speed work). 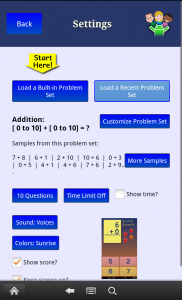 Choose from built-in problem sets of make your own – Choose number ranges; addition, subtraction, multiplication, or division; pick “doubles only” for addition and multiplication. The app remembers your 10 most recently used settings – great for multiple kids. Choose sounds including kids voices, tones, and new electric guitar and “castle” sound themes. Choose from six new color schemes (bright, camouflage, pink dream, nebula, sunrise, blue & green). Choose whether to show the score and time. 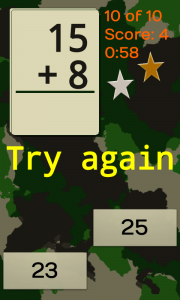 Add optional time limits for working on speed. Pick it up now for 99 cents in the Android Market and soon in Amazon Appstore and Barnes & Noble Nook Shop.